With Diablo 3: Reaper of Souls releasing tonight, I wanted to step things up and replace my keyboard. I’ve owned the Logitech MX5500 mouse/keyboard combo for a little while now, and have yet to find anything better. I decided to expand my search and venture into the gaming peripheral category. I did some research within the Logitech brand as I’m loyal to their products from years of great experiences. There were 3 options that I considered, 1 of them being a completely different style. 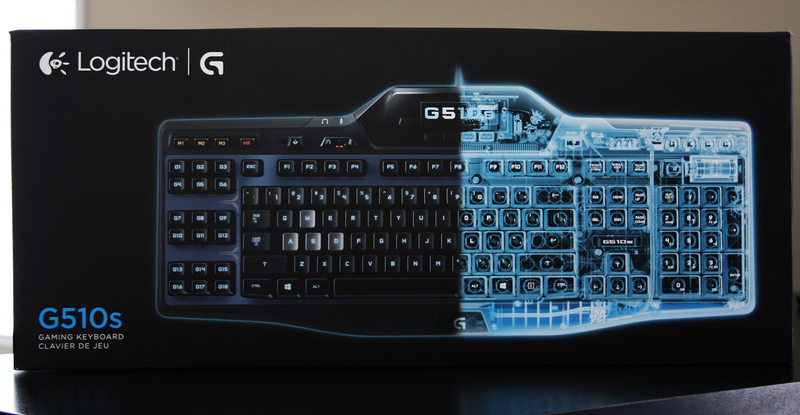 The Logitech G710+ features mechanical keys, whereas other keyboards are labelled as a ‘membrane’ style. I decided against the mechanical type as the keys are louder, but last longer. While longevity isn’t much of a concern to me, noise level is. The other two were this model, the G510s, and the higher end version, the G19s. With an ~$80 price difference, I decided not to go with the higher end model as the enhancements it provided didn’t seem to benefit me. The G510s was a large enough step up from what I’ve previously had so I figured it would suit me well. The first thing I noticed after unpacking it was that the keys are lower than my previous set, so it will require some adjusting. The LCD display is similar to the MX5500, providing information such as computer performance levels, time and date, and media currently playing. Along the top right are media controls, with a nicely implemented volume roller opposed to tactile buttons. The G510s also features a headphone input to use in lieu of the one in a PC tower. It’s a nice addition that I’ll most likely end up using. Another major feature of this model is the backlight. I’ve never had lighting options available on a keyboard, so it was a nice touch to customize. The colour and brightness can be attached to a specific profile as well. I’ve become adjusted to using wireless keyboards for almost a decade now, and have reverted back to wired with the G510s. As a gaming keyboard, it relies on precision and detail. With the extended functionality it requires a consistent, reliable connection and USB is the only way to achieve it. One of the highlighted features to the Logitech gaming keyboards are G Keys. These are shortcut keys placed along the left side that can be fully customized to the application you’re using. At the top are 3 memory banks that can be set to different profiles or even applications. I’ve set one to Diablo 3, and another to Photoshop to assist with faster hotkey access. The keyboard will automatically switch it’s profile when a program is opened. Although it’s brand new, the keys feel very responsive. They’re shaped a little differently than the MX5500, but have more tactile feedback when pressed. The G510s also has a much nicer wrist guard. After typing out this article on the Logitech G510s, I can easily say I’m happy with the purchase and look forward to taking advantage of the G Keys in many different applications.